There are haters everywhere, but in these Rust Belt cities that have seen such challenges with economic and social decline, you would think people would be primed for change. You’d be wrong about that. Anyone who wants to try to change things is going to get brutally slammed. As a lifelong Akronite, who has spent a lot of time visiting, learning, thinking, and writing about the proud and gritty post-industrial cities of the Rust Belt, I can tell you that what Aaron says is absolutely true. In these communities, the only thing that many people dislike more than the status-quo, is anyone doing anything substantive to change it. There are some people who enjoy being miserable, and they live in a self-made prison with a door that locks on the inside. Before the advent of social media, they stayed in that prison. But no longer. Now, they can easily infect the rest of us with their misery. Social media is tailor-made to bring out the crazies, the haters, and the trolls. In most cases, these people are far from representative, but they manage to have an outsized and disproportionately large negative impact, because the reasonable people remain silent. You need to have an iron will and a thick skin to change things in the Rust Belt. Urban revitalization is of existential importance to many of these cities, and it is often a thankless job - particularly for those who work in local government. Running even a medium-sized city is like managing a Fortune 500 corporation, in terms of the level of complexity and the sheer amount of responsibility. The accountability to the people is arguably far greater - everyone who lives there is a customer, and they all get a vote. The services that a city provides have a huge impact on people’s day-to-day lives: police and fire protection, roads and bridges, the provision of safe and clean drinking water, sewage disposal, trash pickup, snow removal, emergency management, and public health. It is really difficult to follow the correct path, and manage all of those tangible public services well. And, in certain ways, it’s even harder to navigate and manage the intangibles of urban and economic development, where there is often no path to follow. Being a mayor is one of the toughest jobs that there is – the pay is negligible for the level of responsibility involved, you can’t print your own money like the federal government can, and most people only notice when you get something wrong. To do it well, you need to be so intimately familiar with a place that you know not only what people need, but what they don’t know that they need. I have the utmost respect for people like Kokomo’s mayor - those who hold office in a Rust Belt environment, where the community is facing many headwinds. I feel the same way about Akron’s mayor, Dan Horrigan. His can-do attitude and love for Akron is why I left a job that I loved to work for him. Change is hard everywhere, but as Aaron describes, it can be painfully difficult in the cities of the Rust Belt - particularly in the realm of urban and economic development. From a world-historical perspective, the cities of the eastern Great Lakes region, in the heart of the Rust Belt - places like Akron, Buffalo, Cleveland, Detroit, Erie, Flint, Pittsburgh, Rochester, Toledo, and Youngstown - are cities that have experienced incredible ups and downs in the short span of just 150 years. Until the Civil War, most of them were tiny agricultural towns located on the inland waterways that became important as the frontier expanded across the Appalachians. By World War I, they were some of the largest, most important, fastest growing cities in the entire nation. They teemed with immigrants and new arrivals, and they collectively produced an incredible share of all of the most important manufactured products on earth: automobiles, glass, machinery, rubber, and steel. After World War II, they began a protracted, incredibly painful and traumatic period of economic and social decline, as the triple whammy of economic restructuring (the outsourcing of manufacturing); regional outmigration (to the Sunbelt); and rapid suburbanization (in a region with a strong tradition of balkanized local government and a history of economic and racial segregation) took an agonizing toll on these cities and their neighborhoods. The degree to which these interrelated trends profoundly affected the psyche of the people who live in these cities cannot be exaggerated. The end of that era, which was marked by strikes, layoffs, and unemployment, was followed by its echoes and repercussions: economic dislocation, outmigration, poverty, and abandonment; as well as the more intangible psychological detritus – the pains from the phantom limb long after the amputation; the vertiginous sensation of watching someone (or something) die. The reason that it is generational, I think, has to do with people (and I’m generalizing) over, say 55, or so, having strong family memories of the place when it was still a manufacturing powerhouse, with plentiful good jobs. Many people long for those good old days to come back, and I think they often feel a mixture of disappointment, shame, anger, and fear that they are not coming back. It is not an accident that Donald Trump won the 2016 presidential election by capturing the votes of older working-class voters in Wisconsin, Michigan, Ohio, and Pennsylvania, who wanted to “Make America Great Again”. Many Gen-Xers like me, on the other hand, can only remember back to the time that the ship was already going down. So most of us look at it far more ambivalently. I feel some nostalgia for an era that I didn’t really live through, and mostly don’t remember, because it was still in the cultural DNA of my childhood. But then I think of my 47 year-old uncle getting killed in 1983, on the job at B.F. Goodrich, by a malfunctioning piece of machinery, and a lot of the romance immediately wears off. Millennials are even more of a blank slate, as they have no living memory at all of that time. I find that most of them (again, I’m generalizing) lack the emotional baggage, and therefore much of the cynicism and bitterness of some older residents. Second, this region of the United States is home to a disproportionately large number of people who were born in the state that they live in, and have never lived anywhere else: 77% of Michiganders, 75% of Ohioans, and 74% of Pennsylvanians were born in their state. By comparison, only 24% of Nevadans, 35% of Floridians, and 38% of Arizonans were born in their state. Please do not misunderstand me. I am not criticizing these people for this. I am one of them. I was born in Ohio, and have lived here my entire life, except for a two-year stint in North Carolina for graduate school. Other than that, I’ve never lived more than a mile from where I live right now. But…I do think that there is a real “the grass is always greener” tendency that permeates many communities in these states. A lot of people, to be quite honest, have no idea what other places are like. The degree to which the weather, for example, is blamed as the source of our problems in Northeast Ohio is quite remarkable. The winter in the economically-prosperous Twin Cities is brutal, and far worse than ours, yet to hear people here talk, you’d think that we were living in Siberia. Traffic is another thing. We live in one of the least congested metropolitan areas in the entire nation, yet you’d think we lived in Atlanta or Washington, D.C. to hear many people complain. I think it all boils down to ignorance (in the plainest, least judgmental sense of that word). They literally just don’t know. And their antipathy toward their own place makes them blind to the problems and challenges of places that they will never live in. Third, and this is the flip side of the previous dynamic – because so many people who live here were born here, and have lived their entire life here, there is a (mostly unconscious) bias against outsiders. But it isn’t what most people stereotype it to be. I actually think that because quintessentially middle-American Ohio’s defining characteristic is that it doesn’t have any defining characteristics (it does, but they’re less obvious) it is actually quite easy for other people to culturally fit in here. When I lived in North Carolina, for example, natives were extremely aware of whether or not you were a Southerner. There were a lot of subtle, but powerful, cultural distinctions that served to reinforce southern pride. I think that it was very hard for people born in the North to ever really be considered a local, even after living in Charlotte for decades. So, I don’t particularly observe people here being overtly unwelcoming or unfriendly to outsiders. And while Ohio has its cultural quirks (Euchre, anyone? Remember, the jacks of the color that is trump become the highest cards, and the right bower trumps the left bower…), it’s a pretty easy place for most other Americans to culturally adapt to. “Why in God’s name did you ever leave [insert city here]? Some of this is good-natured joking, but it still betrays a real sense of shame and inferiority that people feel about the place. People never said things like that when I lived in North Carolina. Even worse, when enough people exhibit these attitudes, they become a self-fulfilling prophecy. Eventually, many of the newcomers are ground down by the negativity, and they move somewhere that they feel they can actually make a difference. Finally, I think that there is a certain type of civic learned helplessness that comes with being a once-heavily industrial, blue collar, working-class community. They also ran the city. There was an unspoken social contract. The workers’ job was to show up and work hard at dangerous and unpleasant jobs. The job of the tire companies was civic leadership - give back to the community, and ensure a good quality of life for the workers. Rubber workers worked 6 days a week, 6 hours a day, and received many generous benefits that the unions had negotiated. The people of Akron came to be dependent on this arrangement. They took a real pride in their work and in the place that they lived, but they outsourced thinking about the well-being of the community to their corporate overlords. A similar thing happened in Canton, Cleveland, Dayton, Detroit, Flint, Toledo, Youngstown, and many other Rust Belt communities. It was a symbiotic relationship that, in many ways, worked well while it lasted. But it was a historical anomaly. It couldn’t last forever. And it didn’t. The 20th century industrial social contract had the negative side effect of stifling the entrepreneurial spirit, sense of ownership, and willingness to take risks that was part of the 19th century civic culture of these cities - the culture that actually created these huge corporations in the first place. People lost their sense of agency in the process, and many learned that when things failed, it had to be someone else’s fault – because they felt like they had held up their end of the bargain and done what they were supposed to do. It was someone else’s job to fix it. The idea that maybe it was no one’s fault, or even if it was someone else’s fault, that I, as an individual, need to do something different – I think that kind of got lost somewhere along the way. People use the pronoun “they” a lot around here. I’m still trying to figure out who “they” are. There’s too much “they”, and not nearly enough “me” and “we”. This culture is starting to change due both to generational turnover, and to a slowly emerging post-industrial economy. But it is still an incredibly powerful force, particularly in blue collar and working-class communities and neighborhoods. 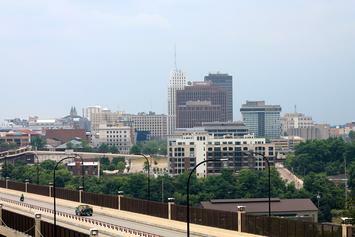 Leaders in the Rust Belt often fall into one of two equal and opposite errors. They either try to turn their place into something that it is not, by obliterating the past and holding the local culture in contempt, out of a sense of shame. Or, they stubbornly cling to every aspect of the status-quo, out of a sense of fear and pride. The past is a tricky thing to navigate. You can’t be held captive by it, be paralyzed by it, or preserve it in amber. On the other hand, you cannot cut yourself off from it, pretend it didn’t shape who you are, or create an alternate reality to avoid it. It is in our nature as humans to evolve and change. It is also in our nature to crave permanence and stability. That paradox is who we are. We are continually delighted by the seasons, because they exemplify our simultaneous desire for change and permanence – ever changing, ever the same. That union of change and permanence is the rhythm of human life. Embodying and embracing that paradox is what creates great urban places. The trick is to embrace the past, and have it inform, but not dictate, the future – to stand on the shoulders of giants, in order to look forward. The future will belong to the cities that are able to do that – to be unashamed of the Rust Belt, and yet transcend it. This piece originally appeared in Cleveland Scene. Jason Segedy is the Director of Planning and Urban Development for the City of Akron, Ohio. Segedy has worked in the urban planning field for the past 23 years, and is an avid writer on urban planning and development issues, blogging at Notes from the Underground. A lifelong resident of Akron’s west side, Jason is committed to the city, its people, and its neighborhoods. His passion is creating great places and spaces where Akronites can live, work, and play. Submitted by qet on Thu, 04/04/2019 - 09:21.
what Renn describes as “the model of the working-class/creative-class, blue-collar/white-collar synthesis that many believe we need today. Not sure I understand how the lengthy diatribe follows from a premise of "many believe." Changing a city is not like changing clothes. Clothes you can change for change's sake. The word "change" is entirely descriptive, not normative, yet that is how too many understand it. I don't live in Akron or in the Rust Belt. For all I know, if I did live there, I would be one of Renn's "many" who "believe." But I just find it difficult to take fully seriously any argument that begins with the premise of "many believe."